Dan Zaiontz, a faculty member of Seneca College, started researching senior academic usage of social media while completing his Master’s degree in Communications (MCM). That research is now part of a book called #FollowTheLeader, which is being published by M. Stoner; January 20, 2015 is the publication date. Dan talks about several educational leaders he admires, like Santa J. Ono (@prezono) from UC, and Paul LeBlanc (@snhuprez) from SNHU. I’m a particular fan of Dr. LeBlanc for many reasons including that I am an SNHU alumni. Being a leader on social media doesn’t mean filling their Twitter streams with lofty quotes; often it means reaching out to rank and file members of the community and being simply accessible to students. 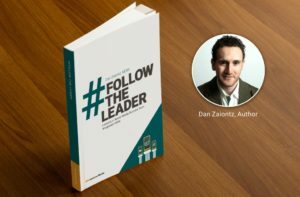 While Dan says he reached out to as many as 150 individuals, all of the folks in the book were initially contacted via Twitter. College and University presidents who use Twitter are not only setting the pace for their institution and their community, but also making themselves role models for all types of enterprises including businesses and non-profits.